Browse the Macy’s Black Friday 2018 Sale Ad & Doorbuster Deals: $29.99 Macy’s Diamond Stud Earrings (1/10 ct. t.w.) in Sterling Silver; Doorbuster $10, After Mail-In Rebate $0 Young Men’s Joggers; Doorbuster $10, After Mail-In Rebate $0 Bella 4-Cup Coffeemaker; $39.99 Bella 2.6 Qt. Air Fryer; $99.99 Nespresso Inissia Red Bundle; $99.99 Keurig K250 Plus Brewing System; $99.99 Ninja BL660 Professional Blender with Single-Serve Cups; 50% off Crux 14624 6-Qt. Programmable Slow Cooker; $39.99 T-Fal Occasion 18-Pc. Cookware Set; $14.99 Tools of the Trade 11″ x 18″ Double Burner Griddle, Created for Macy’s; $179.99 KitchenAid KSM105GBC 5 qt. Stand Mixer with Glass Bowl & Flex Edge Beater; $199.99 Dyson DC39 Ball Multifloor Pro Canister Vacuum, Created for Macy’s; 65% off Pfaltzgraff Winterberry Collection, Created for Macy’s; 70% off Charter Club “Allergen” Featherbed Protector; $49.99 Tag Springfield III 5 Piece Luggage Set, Created for Macy’s; $199.99 Michael Michael Kors Michael Kors Men’s Classic-Fit Charcoal Herringbone Suit; 60% off Alfani Coats, Sweaters More; and more. 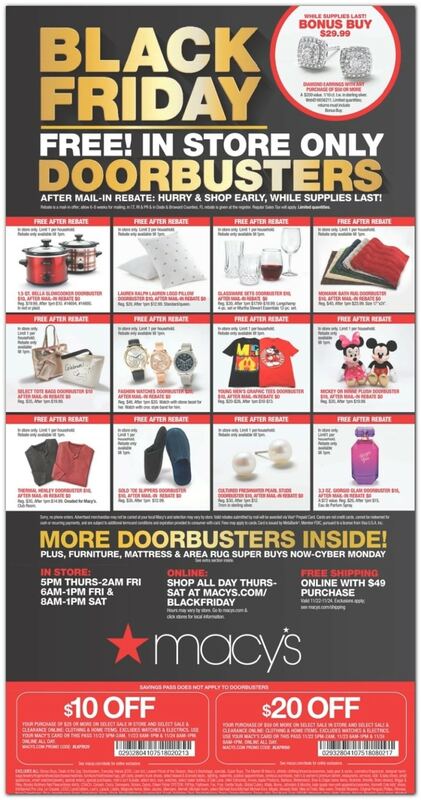 Find all deals and offers in the latest Macy’s Sale ad for your local store.